Welcome, updated as of July 2009. "President Gloria Macapagal-Arroyo has appointed a new commandant of the Marine Corps. The new Marine Commandant, Major General Juancho Sabban, will replace Major General Ben Dolorfino. Arroyo signed Sabban�s appointment papers on Monday night, said Lieutenant Colonel Romeo Brawner Jr., Armed Forces of the Philippines (AFP) spokesman. "Ang Marine Corps nag-devise ng bagong strategy para matalo ang grupo na ito ... We will pursue this line of action, hindi lang purely combat operations, but we will also try to reach out them and try to give them a decent way of living, nang sa gayon hindi na sila kailangang mang-hostage pa," Brawner said. Vagni united with family . Marine Battalion Landing Team 9 deployed to Naval Forces Western Mindanao, which has jurisdiction over the provinces of Tawi-tawi, Zamboanga, Sulu and Basilan, said Navy spokesman Lieutenant Colonel Edgard Arevalo. Fresh from retraining, the MBLT-8 will replace the MBLT-9 in Palawan. The Navy also deployed a patrol ship, BRP Magat Salamat and three multi-purpose attack crafts to the area, he said. The attack crafts can cruise at a top speed of up to 40 knots and are armed with 50-caliber machine guns. They can load up to 20 fully-armed troops, he said. �The deployment of the 8th Marine Battalion and our floating assets to their respective areas of responsibility is in response to the requirements of higher headquarters to address the need for increased tempo of operations in the operational area,� said Vice Admiral Ferdinand Golez, Flag Officer-in-Command of the Philippine Navy. Orange, CA � Commodore Ramon A. Alcaraz, Philippine Navy (Ret) passed away this Thursday, 25 June 09. When Ramon Magsaysay was appointed Secretary of Defense of the Philippines. He had Ramon Alcaraz travel to the USA to study the organization of the United States Marine Corps. Alcaraz said he was assisted by the Commanding General of Marine Corps Recruit Depot. San Diego, and visited the other training facilities such as the Amphibious Warfare School on Coronado, CA, Camp Pendleton and Quantico, VA. 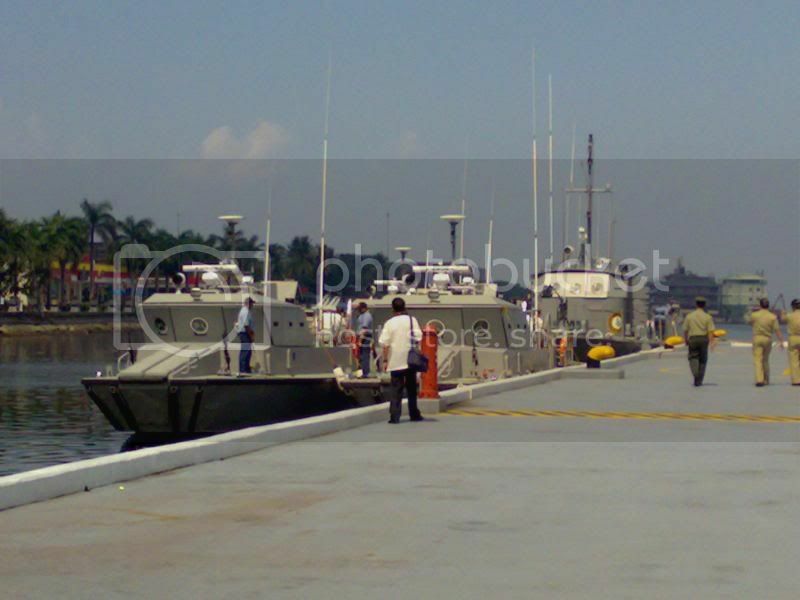 Upon return to the Philippines, Alcaraz took up his billet as Naval Personnel Officer (N-1). Based on his research and material on the USMC, he allocated billets and personnel for the Marine Company of the Philippine Navy. Alcaraz assigned his former Q-boat Executive Officer, Lt. Manuel Gomez as the Commanding Officer of the 1st Marine Company that grew into the Philippine Marine Corps of today. MANILA (AP) � Al-Qaeda-linked militants holding an Italian Red Cross worker captive killed five Philippine marines and wounded 10 others in an ambush Saturday on a southern island. One police officer was wounded. Also in the south, the military said fighting with a different militant group, the Moro Islamic Liberation Front, left 10 dead and 20 wounded on Friday. About 40 militants from the al-Qaeda-linked Abu Sayyaf group attacked marines and special operations police pursuing Abu Sayyaf gunmen holding 62-year-old Eugenio Vagni outside Parang township on Jolo island, said marines spokesman Lt. Col. Edgard Arevalo. 5 Marines killed, 2 APC's immobilized. Slain soldiers in Indanan clash given military honors. 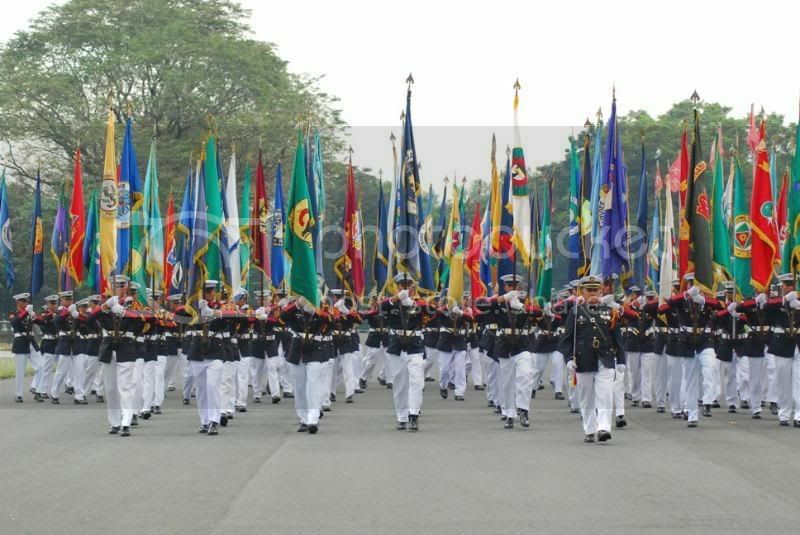 Marines at Independence Day celebrations. CARAT 09 stories and images at this link. Provided by 51st Marine Battalion(Res). Philippine Marine Corps Ad by miko235. PN-Fleet Marine Band wins Battle of Uniformed Bands April 09! Marines carry the massed colors of the AFP at the Anniversary Parade last Dec. 09. New uniforms will be issued in 2009. The PMC will be issuing a digital pattern camouflage uniform in 2009. The first unit to wear it is the Training Battalion that will be participating at the AFP Anniversary Day parade on December 22, 08. Why a low-intensity counterinsurgency strategy seems to be working there. by Max Boot & Richard Bennet 01/05/2009, Volume 014, Issue 16 The Weekly Standard. Now, General Sabban says, the Philippine armed forces and their American allies have "shifted strategy": "I have told my commanders that all military operations should be intelligence-driven and surgical. How do we do this? Through intelligence enhanced by civil-military operations. We do civil-military operations to get people onto our side. More people on your side will produce more and better intelligence, and if you have better intelligence you'll have more successful operations that are precise and surgical and that don't hurt innocent civilians. Thus we will get more support from the people and you will be denying the enemy resources and space to operate. People will drive them from their own areas. So now their space is getting smaller and smaller, until we can pinpoint them with information coming from the people themselves." Fleet Marine: answer to Mindanao?s troubles? Yes its a Ford. But watch to the end of the video to see what they do with it.! ELEMENTS OF 4TH MARINE BATTALION UNDER LCOL ARIEL R CACULITAN IN SULU SEIZED FIVE (5) HIGH POWERED FIREARMS AND SEVERAL HUNDREDS OF AMMUNITION EARLY THIS MORNING ( 9:00 AM, 06 DEC 08) AT VICINITY BARANGAY MANGGIS, INDANAN, SULU. THE RECOVERED FIREARMS INCLUDE: ONE (1) M16 ARMALITE RIFLE, ONE (1) M14 RIFLE, ONE (1) M177 ( BABY ARMALITE), ONE (1) FN FAL RIFLE (7.62 CAL), ONE (1) M1 GARAND RIFLE, THIRTEEN (13) MAGAZINES FILLED WITH AMMUNITION. THE OPERATING ELEMENTS OF MBLT 4 LED BY MAJOR JONATHAN C GABOR FOUND THESE FIREARMS AND AMMUNITION HIDDEN IN SMALL SHANTIES IN THE VILLAGE. THE OPERATION WAS BASED ON THE INFORMATION RECEIVED BY THE UNIT THAT THE GROUP OF ASG SUB LEADER ABDUL GAFUR JUMDAIL WITH MORE OR LESS NINE (9) MEMBERS USUALLY FREQUENT THE AREA AND HID THEIR FIREARMS WHENEVER MARINES ARE CONDUCTING COMBAT OPERATIONS IN THE AREA. ACCORDING TO COL EUGENE CLEMEN, COMMANDING OFFICER 3RD MARINE BRIGADE, THE SERIES OF COMBAT OPERATIONS LAUNCHED IN THE AREA WAS A RESPONSE TO THE CLAMOR OF THE PEOPLE WHO HAVE BEEN VICTIMIZED BY THE SERIES OF KIDNAP FOR RANSOM, EXTORTION, AND CARNAPPING ACTIVITIES OF THE GROUP. WITH THE EVOLVING COOPERATION AND SUPPORT OF THE PEOPLE IN THE AREA, IT IS LIKELY THAT ABDULGAFUR AND MEMBERS OF HIS GROUP WILL BE NEUTRALIZED SOON, HE SAID. CLEMEN ADDED THAT SOME OF THOSE IDENTIFIED TO BE IN CAHOOTS WITH THE GROUP ARE NOW FEELING THE PRESSURE AND ARE NOW COMING OUT TO COOPERATE AGAINST THE GROUP. MGEN JUANCHO M SABBAN, COMMANDER JOINT TASK FORCE COMET, SAID THAT THE AFP FORCES IN SULU HAVE STEPPED UP THE CONDUCT OF INTELLIGENCE DRIVEN OPERATIONS IN ORDER TO NEUTRALIZE THE ABU SAYYAF GROUP AND ESTABLISH A SECURED ENVIRONMENT FOR MORE INFRASTRUCTURE PROJECTS IN THE PROVINCE OF SULU. HE HAS OFTEN EMPHASIZED MORE THAN 80% CIVIC AND HUMANITARIAN PROJECTS AS AFP UNITS? FOCUS WHICH CAN ONLY BE HASTENED IF TERRORIST GROUPS ARE KEPT AT BAY FROM DOING THEIR NEFARIOUS ACTIVITIES. GAFUR JUMDAIL IS THE BROTHER OF ASG LEADER GUMBAHALI JUMDAIL @ DR ABU WHO ALSO RANKS HIGH IN THE WANTED LIST OF TERRORISTS IN THE COUNTRY. Colonel Rustico Guerrero, commander of the 1st Marine Brigade, said the firefight in Barangay (village) Baguindan was continuing Monday afternoon. Fleet Marine Music Video on Youtube! New PMC Force Recon Website. Flash viewer required. "the Philippine Marines will solely take over the security operations in Sulu..."
Marine Brigadier General Juancho Sabban, Sulu military chief, said there is no need to maintain a huge number of soldiers in the province as the troops have already accomplished their earlier missions with the killings and capture of many Abu Sayyaf members. Tens of thousands of troops were sent to Sulu in the past years to fight the Abu Sayyaf, the loosely organized group linked to Osama bin Laden?s al-Qaeda terrorist network that has been responsible to abductions of foreign nationals and bombing operations in the past. "Sulu needs fewer troops since the threat problems have remarkably dropped and the threat level is now more manageable," Sabban said. 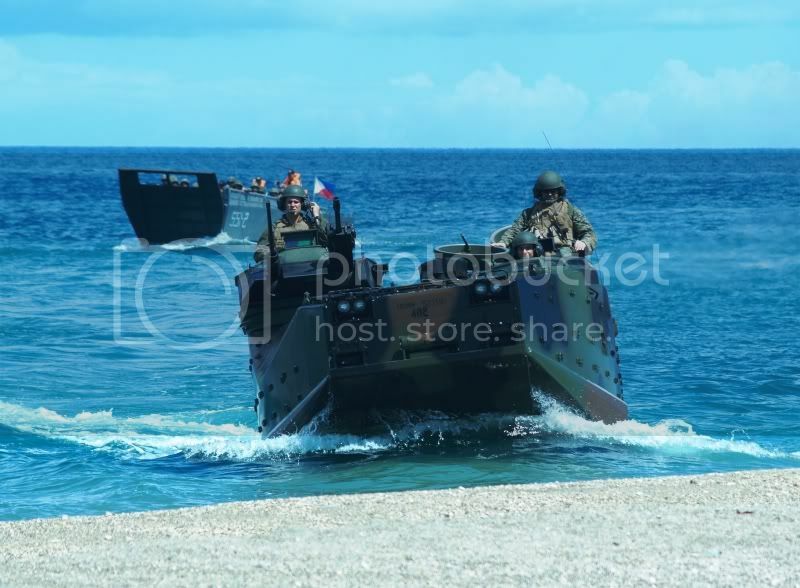 Philippine Marine units engage Abu Sayaff (ASG)in Jolo, neutralizing one terrorist as reported by the 3rd Marine Brigade to Task Force Comet Commander BG. Juancho Saban PN(M)AFP. "An Abu Sayaff member was killed Friday during the 15-minute fire fight between the terrorist ASG and the Special Operations Platoon of the Marine Battalion Landing Team-5 at the vicinity of Brgy Pansul, Patikul, Sulu. The said platoon encountered around 10 ASG members. The following items were recovered from the enemy side: 1 M16 rifle; 8 long and 7 short M16 magazines with 170 rounds of ammunition; 1 cellphone with charger; 1 map; and 1 wallet." The Joint Task Force Comet commended the soldiers for jobs well done. Every terrorist neutralized and every weapon seized indicate that the country has been rid of a serious threat --making every Suluano?s existence safer. "Nevertheless, our soldiers will relentlessly pursue all the other Abu Sayaff bandits, refrain them from carrying out their vicious activities or if not, to completely crush them. Even as we trod in the right path, the end still lies ahead; there is still so much to do. There are efforts from the enemies to regain what they have lost; it is our job to prevent them as we go onwards with our tasks,? JTF Comet Commander B/Gen Juancho M Sabban stressed. "The successful operation indicates how persistent our soldiers pursue these cold-blooded bandits, capture them and seize their weapons to ensure the safety and well being of the people," Sabban added. Moreover, B/Gen Sabban thanked the civilians, saying that the success of the recent operation is also the result of the support and cooperation extended by the local populace towards the military.
? ?The heightened alertness and vigilance of our people significantly helped our troops in their operations against the ASG. Hence, we are grateful for their full support,? he said. A 15-minute firefight reportedly ensued which the military said resulted to the death of one of the bandit group's member and who was only identified as "Long hair". The military said the body of the fatality was clad in an Army uniform when it was recovered. FORCE RECON: "Marines' elite force hunts Sayyafs in Sulu"
Fourth Marine Brigade Newsletter, Jan 2008 in PDF can be downloaded from ADROTH Reservist website. 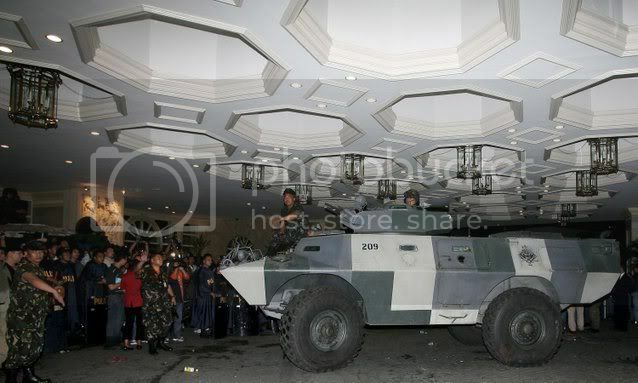 Marine Ready Force goes to the Ritz (Manila Peninsula Hotel) ... Puede ba ito sa Valet Parking? Ready if something else may have come up. PMC V150 knocks on hotel front door! 360 image of Hotel entrance beside Marine Ready Force V300! Another good news is that the Philippine Marine Corps isn?t experiencing rock-bottom low morale as some quarters will have it. The Marine Corps is celebrating its 57th anniversary this week. 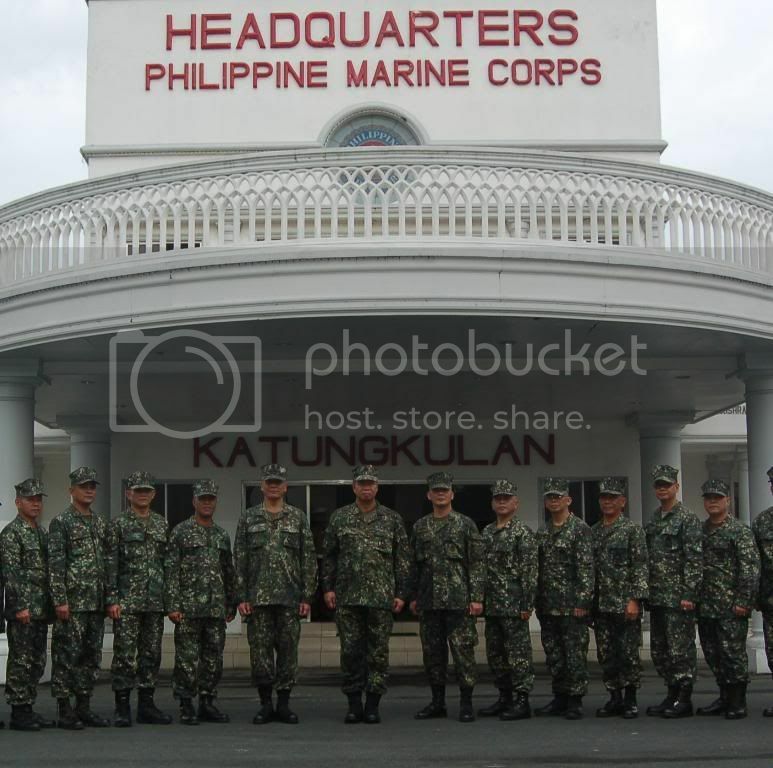 According to the Marines official website (www.philippinemarinecorps.mil.ph) ?The Philippine Marine Corps? history unfolded during the incumbency of President Elpidio Quirino. Pursuant to AFP General Order Nr. 319 dated November 2, 1950, the organization of ?A? Company, 1st Marine Battalion as a unit of the Philippine Naval Patrol was authorized and thus, the Philippine Marines was formed. However, it was under the mandate of the then Secretary of National Defense Ramon Magsaysay that ?A? Company was activated on November 7, 1950, at the Naval Operating Base in Cavite.? The Marines are a colorful lot?it isn?t for nothing that they are called ?the few and the proud.? 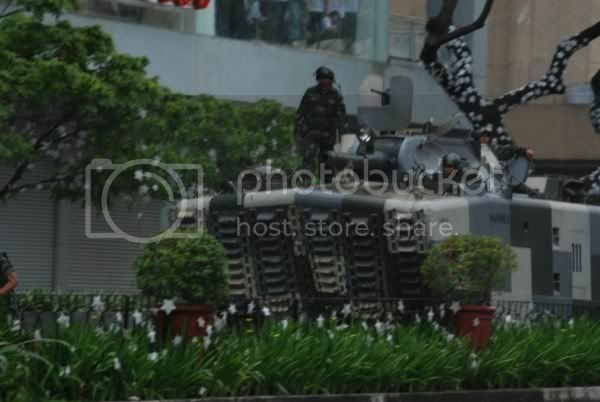 Due to the involvement of some Marines in recent coup attempts, much attention has been drawn to them. Some are facing charges for breach of military discipline. There are people who project these Marines as the best and bravest in the military. However, not everybody agrees. Many have served better and more professionally in the field than those in jail, a Marine officer told me. Some of the men behind bars are being portrayed as great heroes?but others are even greater heroes. A Marine reminds his fellow Marines: ?The real fight is not on those concrete pavements and highrise skyscrapers of Makati City but out here in the thick forests of Basilan, exotic jungles of Sulu, unchartered islands of Tawi-Tawi and in the marshlands of Central Mindanao ? (Cite Mar 2003). The Marines have been used by unscrupulous people, including some of their own officers, and spouses and civilian backers, as drivers, bodyguards, dishwashers, gardeners, you name it. Ironically, some of those who talk the loudest about a demoralized Marine Corps have at one time or another used whole football teams of Marines as free, personal staff. We are good at using our power, in whatever form it comes, in ways that run counter to the interest of the common good. The idea of a common good, it would seem, is absent from our collective conscience. Date: Fri, 9 Nov 2007 10:46:58 +0000 From: Wayne Subject: 09 - DND chief hails Marines for upholding the Constitution Defense Secretary Gilberto Teodoro paid tribute to the Philippine Marine Corps for upholding the Constitution and for sticking it out with the chain of command which is headed by President Arroyo, she being the military?s commander-in-chief. Addressing the Marine officers and men during the corps? 57th anniversary on Wednesday night at the Marine headquarters in Fort Bonifacio, Teodoro praised the Marines for its professionalism in carrying out mandated tasks. ?I have full trust in the Philippine Marines in particular and in our soldier in general in the professionalism with which you discharge your sworn duty to protect our people, to defend the constitute and to obey the chain of command,? said Teodoro. .... ?Along this line, I reiterate it is once again my intent to advocate the whole DND team concept, DND-AFP as one mutually reinforcing each other to accomplish our mission,? the defense chief told the officers and men of the Marines. ?There is a need for a closer coordination and cooperation among the bureaus and agencies of our department and the three major services of the Armed Forces down to the various military units in confronting the various national security challenges facing the country today,? he said. Teodoro said there is a need to march in one direction and synchronize all efforts ?for greater effectivity and efficiency in our work and in our advocacy for a stable and secure nation.? ?On this aspect, I have high regard for your cohesiveness and unity anchored on your motto, the few, the proud, the Marines. However, we should not be island on our own. We must embrace the concept ofjointness with the otherservices in order to enhance our interoperability withthe overarching aim of achieving of our entrusted missions,? said Teodoro. ?Let us be one team in the DND and the AFP. In closing let me assure the leadership and the membership of the Philippine Marine Corps that the DND will continue to support your endeavours which will not only contribute to the strengthening of the Armed Forces of the Philippines but will also redound also to the ultimate betterment of our country and our people,? he added. PMC Armored Vehicles featured in Military Machines International Magazine cover. Stalking Jihad featured on History Channel last Oct.20. Marine efforts well described in the hunt for Abu Sayaff. From the PMC Citemar 6 archive. 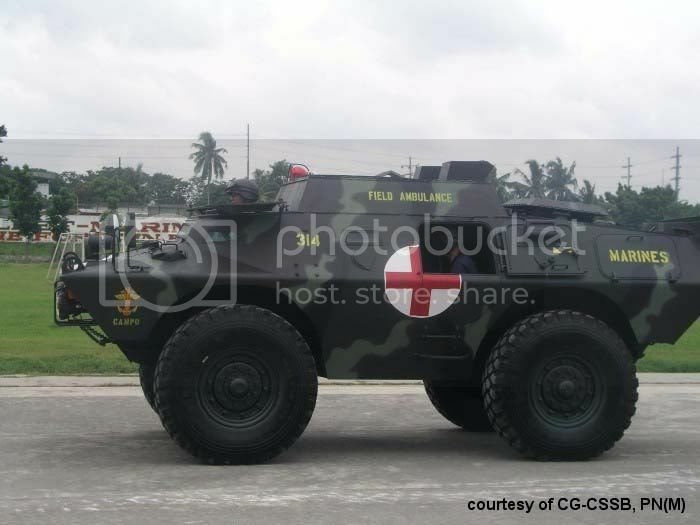 Marines to send newly constructed Armored Ambulance to Basilan this September via Phil. Navy Sealift. The Combat Service Support Brigade (CSSB) accelerated the construction of a V150 Ambulance from a derlict hull that had been no-operational. Utilizing an engine removed from a later model V-150S that was converted in the LARSU program, should provide greater mobility to evecuate casualties under fire in Basilan and Jolo. Col. Oliver North interviews BG Juancho Saban on Fox News. PMC in the news (at Jolo). 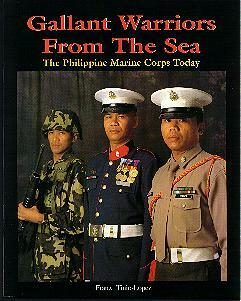 March 07 issue of Atlantic Monthly covers the Philippine Marines in the hunt for Abu Sabaya. *Note: article available to registered subscribers only. Mark Bowden, author of "Jihadists in Paradise," on hunting down the story of Abu Sabaya. But since when the Marines assumed office early as June 2006 the crime rate in our area of responsibility will immediately become low," Baanan said. "This Is the War on Terror. Wish You Were Here!" Outside Magazine, February 2007 online, on the island of Jolo. By John Falk. More photos by Antonin Kratochvil. Click on image above to view slide show. View contents of "Cutting Edge" in PDF format. View contents of "Tides of Change" in PDF format. Order Hard Copy of books "Cutting Edge" and "Tides of Change". NEW "CP" , a comfortable place... in Quantico, Virginia, USA. In Memory of Friends and Comrades, Marines. "Fair Winds and Following Seas!" Vice Admiral Santos retires as Flag Officer in Command of Philippine Navy.